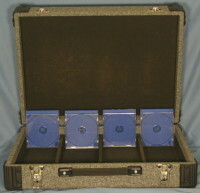 Grey Material Finish (Wooden) – 4 lane – holds approx 160 CDs – Spine up. with detachable lid. Size approximately external 61cm wide x 45cm height x 17cm depth. Internal 56.5cm wide x 40cm height x 15.4cm depth. Lane widths approximatly 13cm.